Size: 8 1/4" x 11"
This June 28, 1971 Vintage Sports Illustrated magazine is complete and in very good condition with slight wear, creases and slightly yellowed pages. This vintage 1971 Sports Illustrated Magazine measures approx. 8 1/4" x 11" and is suitable for framing. 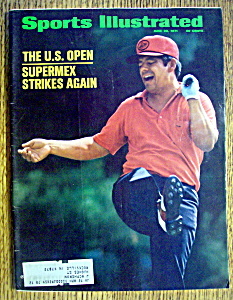 The front cover features "The U.S. Open: Supermex Strikes Again". Full of sports & news stories of the day and nice vintage ads.